Today's challenge at the Castle was to create anything as long as we used an "older" Kat Stamp. Well, that's definitely easy to do with so many amazing stamps to choose from. I love the Child's Play stamp set and I wanted to create something different with them, so I created this notebook. It was a Christmas leftover, so I covered the front and back with cardstock, stamped my images several times on cardstock, then arranged them on the front cover. Hope you like it!! Check out today's hop. Here's the full list. WOW! This is just fabulous. 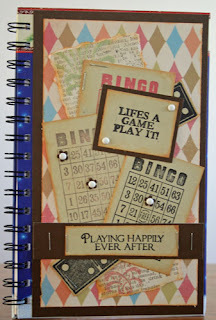 Love those stamps and all of that layering.